God it’s been grey. I feel like I’m in a scene from The Others, thick damp mist, gloomy interiors and er, thinking I’m alive when actually I’m dead. Ok, maybe not that bit. But this morning, opening my shutters, I saw a few green shoots in the window box, which cheered my heart, this reminder that there will be a Spring. 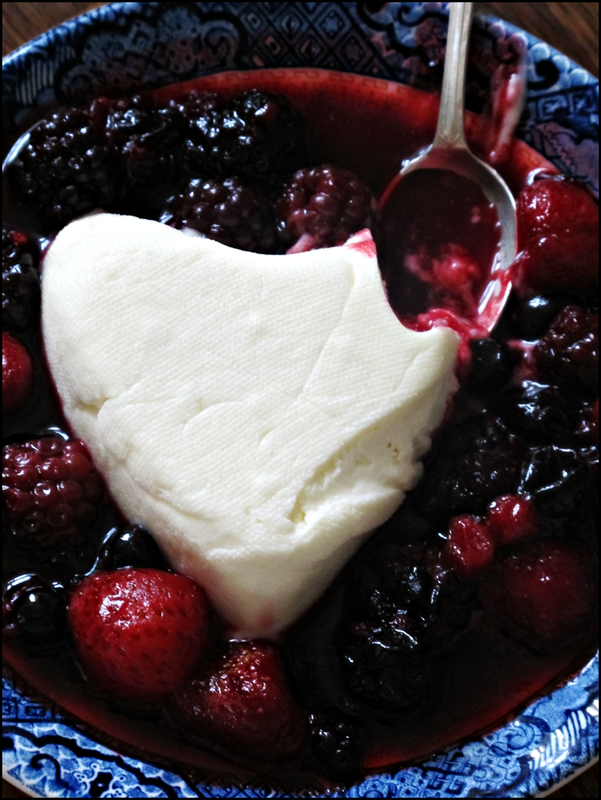 This recipe is very Valentines Day; the heart of the cream once the whey has drained. It requires that you purchase a white ceramic heart shape dish with holes in the bottom. Go on, you know you want to. Failing that, you could use disposable tin foil cups and punch some holes in the bottom for draining. It’s also dead easy. 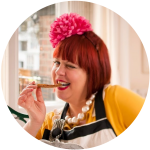 You get maximum deliciousness, look like you are a whizz in the kitchen, with minimum effort. Set the heart in a dish of warmed forest berries. I’m making a habit of keeping a half kilo bag of mixed berries in the freezer. You can whip them out at any point, heat them up and add some sugar, some lemon juice, a little liqueur if wanted and serve with cream, yoghurt, muesli, meringues, on waffles, pancakes, french toast…. Mix all the cream heart ingredients (mascarpone, cream, vanilla, icing sugar) together by whipping gently (not overmuch as mascarpone easily turns to butter). Dampen the cheese cloth and line your dish with it, pressing the cloth into the corners of the heart. Scoop the mixture into the cheese cloth lined dish and smooth the top. Give the mould a little bang on the worktop. Place on a saucer in the fridge to drain for a few hours. Warm up the berries with the sugar, lemon juice and creme de cassis until they are bubbling hot. Let it cool to lukewarm. 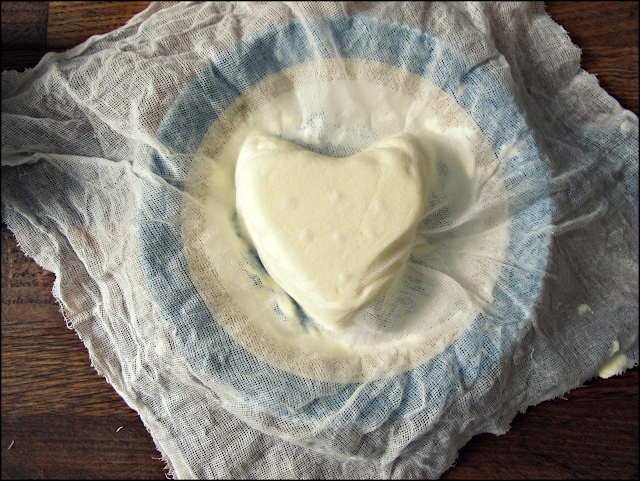 Grab the cream heart, unmould it carefully, gently peeling off the cheesecloth, flip it over onto the dish. 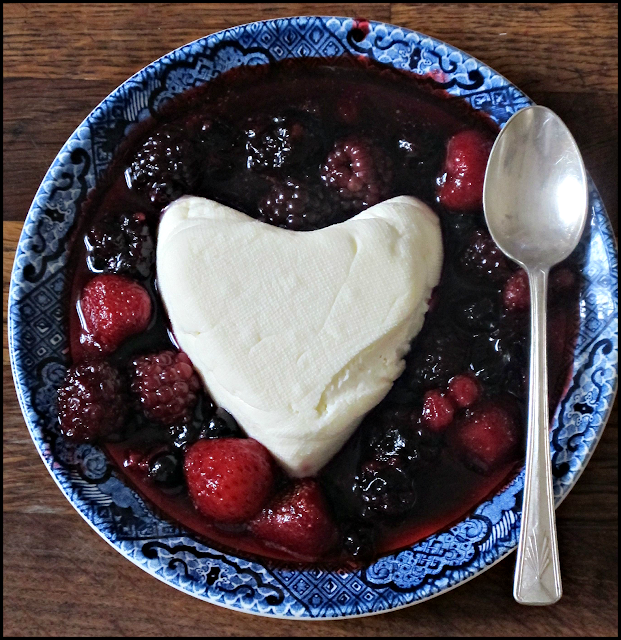 Surround the heart with warm berries. Serve. Well at least the heart is not pink. That would be just TOO tacky! Alcoholic forest berries, I simply love the sound of that. And I must tell you that "The Others" just scared me silly, and I am silly enough.